Blue Melody has an intense blue-violet shimmer in a soft cornflower base. All nails are 2 coats over 2 coats of Sephora Myrtille. Dark Star is the fifth in a series of limited-edition nail Paulishes. It is made with assorted moons and stars in blue-violet and black holographic micro-glitter in a blue and pink-shimmered clear base. I used 2 coats of Dark Star over 2 coats of Sephora Military Jacket. Good for Blue! is made with assorted blue-violet holographic and metallic glitters swimming in a blue moonstone-shimmered clear base. Shown is 1 coat over 2 coats of Urban Decay Vice. MerLovin’ is made with metallic, matte, satin and holographic cyan glitters in assorted sizes and shapes all in a clear pink-shimmered base. For these photos I used 1 coats over 3 coats of Robin Sent Me. Opal Hope Full is a complex blend of matte aqua, neon pink and green, iridescent aqua-green glitters and holographic micro-glitters in a multi-shimmered clear base. Shown is 1 coat over Blue Melody and Sephora Myrtille. Robin Sent Me. is a pastel aqua creme with aqua and pink shimmer. Here is 3 coats with top coat. Skinny Mini Beautiful Me is made with blue-green micro-glitter and assorted jewel-toned accents in a clear multi-shimmered base. All nails are 3 coats with top coat. 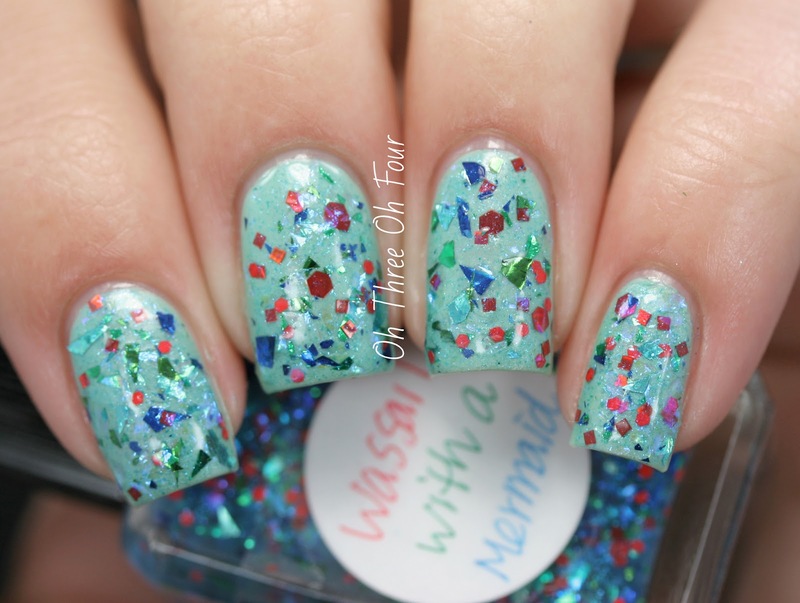 Wassail with a Mermaid is made with metallic and holographic cyan shards accented with red and green glitters in a cyan-shimmered cyan base. I used 1 coat of Wassail with a Mermaid over 2 coats of Skinfood Nail Vita in Apple Milk.